Yeah, we know. Food’s expensive. Gas is expensive. You can’t even remember when you last had a wage rise. The job market is dire. But Planet Ponzi is all about taking positive action to help yourself, no matter what conditions are like. So here’s our formula for success – one pioneered by Nancy Pelosi, though in truth just a variation on how almost every politician of almost every political persuasion behaves while in office. Get elected to something. 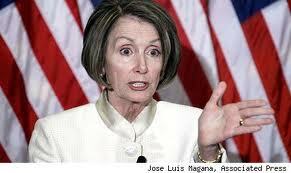 Nancy Pelosi got elected to Speaker of the House of Representatives. Nice move. Invest a chunk of money in something. Nancy Pelosi and her husband invested in VISA, first upon its IPO and more subsequently. At its peak, their investment totalled some $5 million. Now Nancy Pelosi and her husband are high net worth types – they’re politicians, so naturally they deserve to live a lot more comfortably than you do – but all the same $5 million was quite a chunk of change even for the Pelosi’s. Insider trading laws do not apply to me, your point is? Several bills affecting credit providers snaked through the House in 2008, including one introduced by Rep. John Conyers (D-Mich.) that would have ended the swipe fees, the small percentage that credit companies like Visa charge with every transaction. Another bill by Rep. Carolyn Maloney (D-N.Y.), affording significant new protection to credit-card holders, passed the House but did not make it through the Senate. Conyers’s legislation passed his House Judiciary Committee with bipartisan support on Oct. 3, 2008, the last day lawmakers were in office before leaving to campaign for the election, but was not brought to the floor, which Pelosi controlled as speaker. Pelosi’s office says she chose not to bring up the swipe-fee bills in 2008 because she did not believe President George W. Bush would sign them into law. And VISA’s stock price? It’s $94 today. Its IPO price was $44. Priceless.